Finca Ecologica Ekachakra is an eco-village (non profit organization) located 85 km from Santiago city and 2 km from Catemu in a beautiful rural environment. The area is very green and natural, and the farm is surrounded by fields, hills, crops and great landscapes. 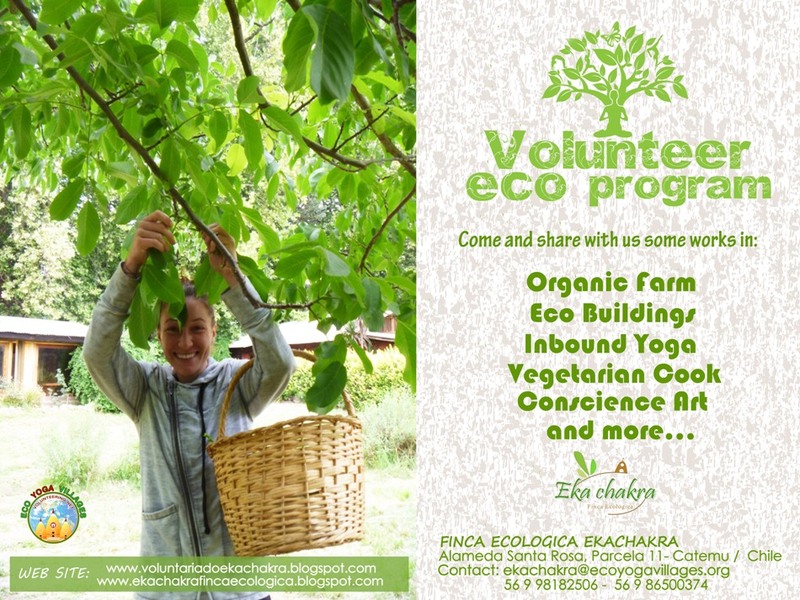 Volunteer program is specially designed for those who want to experience an eco friendly way of life; you can take part in sustainable activities, such as organic farming, eco building, vegetarian cooking, etc., while at the same time experience the peace and harmony afforded by yoga and meditation. Volunteers work for 4 to 5 hours a day in sustainable activities during the morning. In the afternoon you are free to take part in Ekachakra´s activities (hatha yoga, bike riding, music therapy with oriental instruments, vegetarian cooking lessons, movies, etc), or simply relax, read a book, or take a walk through the surrounding rural environment. All the year around, volunteers from all over the world come to Ekachakra to discover their skills, get in contact with mother earth, help improve their local community, get to know new people, learn Spanish and enjoy nature and the experience of living in the community. Please note that we request our visitors and volunteers to abstain from intoxicants, eating or bringing animal based food, and extramarital relationships to preserve the sanctity of the project. Ekachakra is also a Yoga Ashram, every day you can take part and learn about the most ancient Indian teachings in classes on Vedic philosophy. we also offer hatha yoga classes that enable you to harmonize mind, body and spirit. You are also encouraged to practice meditation with oriental instruments to help you connect with your inner self.